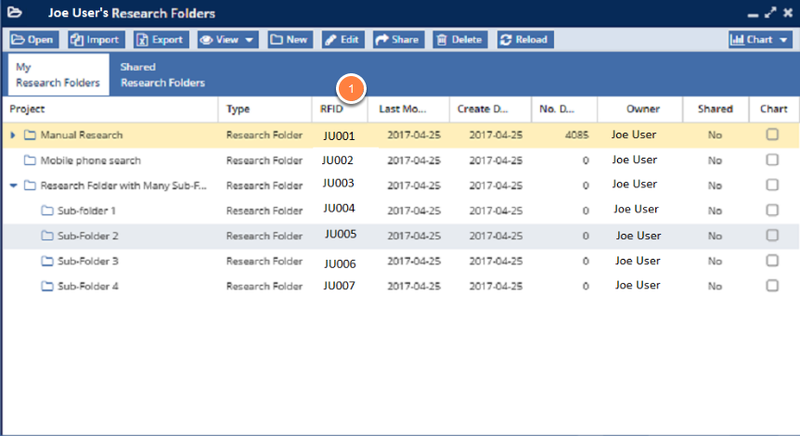 When you create a research folder, the folder is assigned an ID number we call a "Research Folder ID" or RFID. You can think of every document inside that folder as being tagged with the ID number of the folder. RFID numbers are easy to remember since they start with your initials followed by a four digit number. For example John Smith's folder would be something like JS3213 or JS0324. A folder shared with John Smith would include that person's RFID. For example, a folder from Erin Jones would be something like EJ0023. The RFID field code is very powerful since you can use Boolean login on them and effectively carve out all variants. RFID:JS0001 --> Finds patents in the JS0001 folder. RFID:(JS0001 OR JS0002) --> Gives you a de-duplicated list of documents in both folders -- the Union of the two folders. In other words, if one folder has 30 documents and the other folder has 25 documents, but 5 documents are found in both folders at the same time, this search will return 50 documents, not 55. It will only give you those 5 documents found in both folders once. RFID:(JS0001 AND JS0002) --> Gives you the intersection, or the documents found in both folders -- the Intersection of the two folders. In other words, in the example with 30 documents in one folder and 25 documents in the other, where 5 documents are found in both folders, this search will only return those 5 documents found in both folders. RFID:(JS0001 NOT EJ0001) --> Gives you patents in MT0001 but NOT EJ0001--the set difference. Click the "Research Folders" icon on the AcclaimIP desktop. The folder IDs are in the RFID column (1).